Bees, baseball and bonding! Pilot Salt Lake City recently hosted more than 75 people at its customer appreciation event held at a Salt Lake Bees baseball game. The large crowd turned out for a family-friendly evening of baseball and dinner. “This is a great way for us to thank our customers for their loyalty and business,” says Shawn Burrell, district manager. “It’s also a chance for our customers and station team to get to know each other on a personal level and in a fun, casual setting. 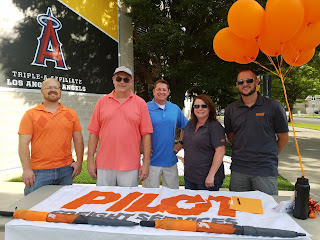 Plus, we get to connect face-to-face, and we love meeting our customers’ family members.” The first-place Bees play minor league baseball in the Pacific Coast League and look to be in a great spot to play post-season playoff ball. The team is also the Triple A affiliate of Major League Baseball’s Los Angeles Angels. Shawn says that a great time was had by all.